Partnership between MG Motor India and Carzonrent's Myles to provide next-generation mobility solutions. MG Motor India today announced a strategic tie-up with Myles, the car sharing and car subscription company from Carzonrent. The aim of the partnership is to provide next-generation mobility solutions to customers. MG Motor and Myles believe that the value of this tie-up will be over Rs. 250 crores in the first phase. This would enable introduction of MG cars with disruptive car ownership solutions in partnership with Myles. 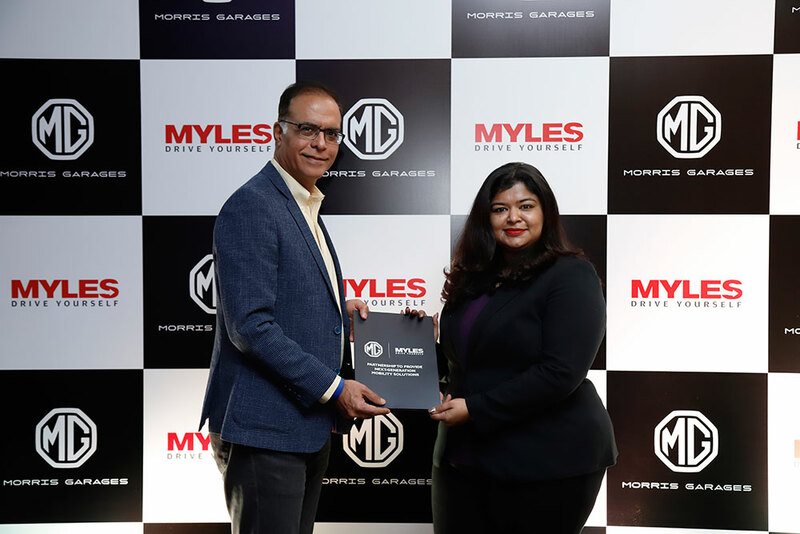 With plans to launch the MG HECTOR in Q2 2019, the partnership will also enable MG Motor India to leverage the existing network of Myles across 21 cities in addition to its own network of 110 sales and service touchpoints at the start of sales. said Sakshi Vij, Founder & CEO, Myles. This strategic tie-up with Myles is part of the ongoing ‘MG Drives Innovation’ initiative. As part of this innovation drive, MG Motor has conducted several programs to identify, encourage and recognise start-ups in the automotive space. of the company’s total workforce and it plans to further increase this in the future. With a focus on three key organizational pillars – INNOVATION, SAFETY and DIVERSITY; MG Motor is building a strong base for its future operations in India.